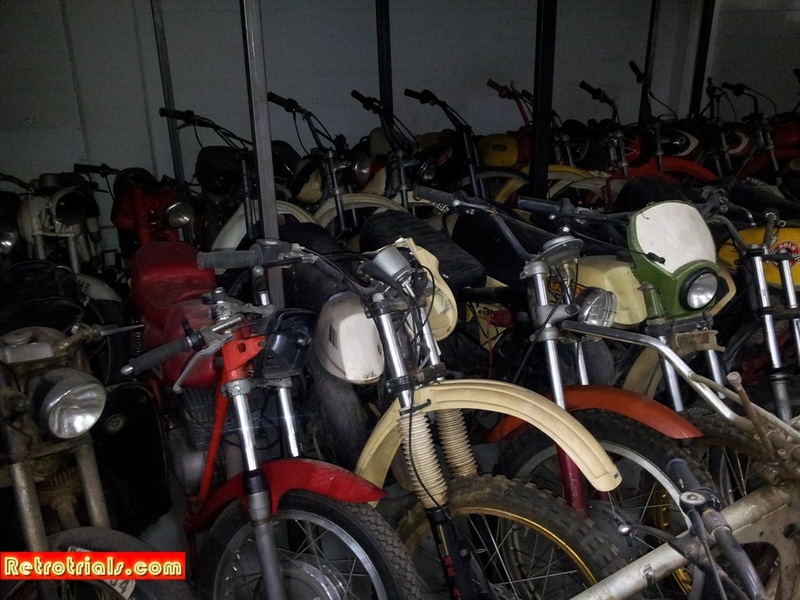 In March 2014 Retrotrials was lucky enough to invited to view a very special motorcycle collection located in Northern Spain. The owner who wishes to remain anonymous has never allowed photos of his collections before. It did however transpired through various telephone calls through a translater, that he would on this occasion allow photos to be taken as he felt sorry for what he described as an English Retro Trial lunatic who was soon to be visiting the Country. 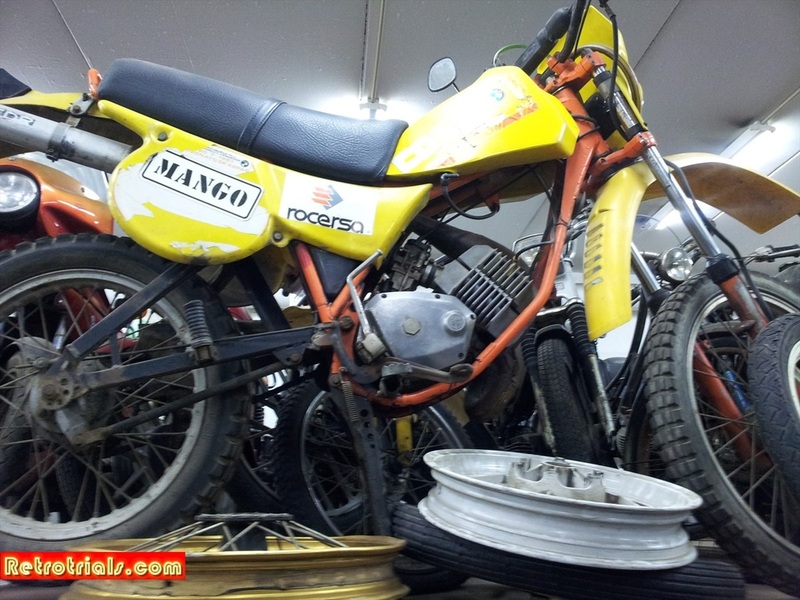 The owner is a gentleman who has been acquiring motorcycles since the 1970's.He was a keen trials rider and also rode enduro motorcycles from time to time. Whenever a motorcycle became available that he liked , he bought it , or was simply given it. He explained that during the 70's motorcycles were in much more abundance than they are now. There was also more money available. As a result he was just given so many of these motorcycles. Can you believe it ? Why cant we find people just willing to give us old trials bikes. They were right when they say "They are the good old days" ha ha . When i visited i was going to face a translation problem as i speak poor Catalan (but im trying , each day). To help a friend Santos offered to come along and help me. Santos's father owned Vasan.sa. They were the company that made the Merlin and Mecatecno Chassis. Santos himself worked at the legendary trial store KM.2 as well. Santos was the perfect man for the job. We arrived together and met the owner of the collection. He was very happy and proud to be showing us his collection and i thank him for it. We were grateful that he let us in. Thank you. The owner took us from one from of motorcycles to another chatting as we went . He was explaining a few of the motorcycles to us as we walked.As is normal in these circumstances the owner was accessing us as well and deciding whether he trusted us. This of course normal. You do not open your garage to , do just anyone do you ?. I'm sure the owner could tell our combined knowledge was reasonable thats all , but im sure he could sense our enthusiasm. We had past the test. The owner then took us into a hallway and then into a lift suitable for containing motorycles. We went to a different level and the owner walked in front of us and opened some double doors into a store room. This contained about 40 motorcycles. As far as i was concerned , we had seen the lot . I wasnt expecting to see any more bikes at all. After spending 30 minutes in this room we then travelled by car to another location. We got out of the car and then walked with the owner to a small single door. I knew we were heading to see more bikes , but i didnt know what to expect. He put the key in the door and disabled the alarm system. He opened the door and inside was complete darkness. He leant in and flicked the switch. Florescent lights flicked into life and he stepped out of the way . Santos went ahead of me . I stood in the door way and i was speechless. Its only after about 5 seconds that i realised that my mouth was open. This was a jaw dropper.